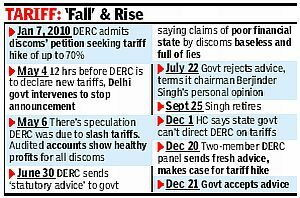 DERC : Power tariff ? The Priyadarshini Vihar RWA organized a Property Tax Collection Camp in the colony on Saturday, 28th May 2011, for the convenience of the residents of Priyadarshini Vihar and nearby colonies; and to assist MCD to collect more tax, About 100 people including from Laxmi Nagar, Guru Ram Dass Nagar, and East End Enclave paid their property tax and obtained receipts. Priyadarshini Vihar RWA organizes this camp every year. Most of the visitors were senior citizens, who felt very happy and appreciated the good effort made by the RWA. Shri B. B. Tyagi, the area Councillor also paid a visit and appreciated the RWA for its efforts in helping the MCD in collection of property tax. He also thanked the MCD staff for their co-opertion. New Delhi: Owners or occupants of a house are bound to pay the membership fee to the Residents Welfare Association (RWA) of the colony to fund its various welfare activities and services, a Delhi court has said. "Being an occupier of flat, the person is bound by the terms and conditions of the RWA and he is also bound to pay the monthly subscription as he is being benefited by the welfare activities which are carried out by the association," Additional Senior Civil Judge Gautam Manan said. The court gave this judgement in an over six-year-old dispute, asking S S Rana, a resident of Maurya Enclave at Pitampura in North West Delhi, to pay Rs 3,900 with interest to his RWA, calculated at the rate of Rs 50 per month. The RWA had filed a suit against Rana contending that as per its rules, it is mandatory on his part to be member of the...association and pay the monthly subscription as it is carrying out welfare activities such as cleanliness of block and park and is also providing watchmen, sweeper, electrician and plumber service to its occupants members including Rana. This was refuted by Rana saying he is neither a member of the RWA nor bound by its rules and regulations. The court after hearing both the sides ruled in favour of the RWA and said if the owners and occupants of houses will not pay the fee, it will be impossible for the RWA to carry on with welfare activities and services. with thanks : financial express : link above for detailed news. MOHALI: While over 400 parks in Mohali, under the care of Greater Mohali Area Development Authority (GMADA), are faced with abject maintenance and upkeep for the last 12 months, resident welfare associations (RWAs) in various sectors and phases have been maintaining and beautifying 90 such designated green zones for the same time with contrasting results. After years of spending crores of tax payers money on the issue, GMADA recently took over the maintenance aspect of the said parks from the municipal corporation. On the other hand, the RWAs have been going about their business with consummate ease and are receiving money from GMADA each month for maintenance of the parks at the rate of Re 1.30 per acre. Manish Nagpal, a RWA member of Phase-IX said, ''We have been maintaining the neighbourhood park in our locality for the past one-and-a-half years. But parking of vehicles or stray dogs making the park their abode needs to be checked. Though we have asked GMADA authorities to hand over a couple of parks to us for maintenance, they have been reluctant to do so. ''In June 2010, GMADA was poised to hand over the periodic maintenance of parks to the council but the local body objected to just being given maintenance charge of the parks and wanted a significant amount of cash to be able to carry out the maintenance of these parks. If you paint the exterior of your house, especially the rooftop, white and put sun-control film on the glasses of your windows, your home will need up to 20% less air-conditioning than it does now. Tips and tricks like these will go to 27 lakh power consumers across the city from power distributors BSES Yamuna and BSES Rajdhani, which launched the "My Cool Ideas" campaign on Tuesday. The campaign has invited ideas from residents, students, professionals — essentially everyone who is a power consumer — to conserve electricity through innovative ways and beat the heat. Consumers of the two discoms supplying in majority of Delhi have been invited to participate and contribute ideas to the company’s website,www.bsesdelhi.com. In addition to that, the discoms, are also using all their public awareness tools like the Synergy newsletters attached to electricity bills, SMSes, RWA forums etc to engage people in this campaign. To promote greater public participation in the decision-making process of the MCD, in March this year, the then mayor PR Sawhney had announced that the civic agency will set up a resident wards committee (RWC) in each of the 272 wards of the city. Through these committees, resident welfare associations (RWAs) will be able to have a say in the policies being made by the councillors. 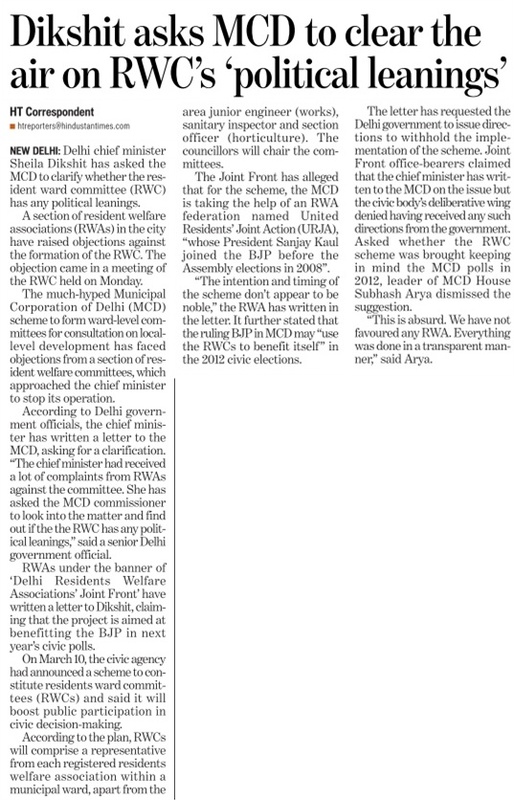 However, when the Municipal Corporation of Delhi (MCD) held a meeting on Tuesday with municipal councillors, most of them rejected the idea saying it will lead to more problems. Headed by present mayor Rajni Abbi, the meeting was attended by about 30-odd councillors. They said that each ward has a dozen RWAs and if the scheme is implemented, each RWA will demand work only in their area and there will be disputes between them. Sawhney's idea was that the RWC will be constituted by involving a representative from each RWA within a ward and will be chaired by the ward municipal councillor. We highly appreciate and acclaim the efforts being made at the top level by holding ‘video conferencing’ and having ‘bhagidari’ scheme, e-governance etc. etc. These are all, of course, get wide publicity through the media! But what is the situation at the ground level! This is worth probing into! Kindly also appreciate and help to resolve the problems. They are innumerable which have been ventilated through various communications and channels to the authorities concerned but no avail. Hence we are expressing over here with expectation that ‘some positive action’ will be taken in the right direction to resolve the problems on a time-bound programme basis. Why we are in the age and time of e-governance the authorities concerned do not give publicity to their e-mail addresses, besides the help lines etc. which are hardly attended to and even attended, there ends the matter! We have been repeatedly requesting and pleading with the authorities concerned only two minor things and these too are not attended to or complied with! Can you make them alive to the situation and respond to the various complaints made? We request them first to acknowledge all communications received by them and second to reply within a time limit and in case of difficulty to appreciate the problem better, give a call to the signatory to meet them in person to understand the problem in proper perspective and answer them at the spot what they propose to do! Are we asking for more? Be yourself be the judge!! Herein we are only highlighting and confining to the problems of the Anand Vihar Society which is one of the two biggest cooperative residential housing societies in East Delhi. Let’s go department-wise so that there is clarity and direct the grievances to the authorities concerned to respond within a time-limit and give us a target date by which the works required to be carried out will be completed. The sewer lines too, which were laid over three decades back warrant replacement with a wider gauge to meet the requirements. Meanwhile, a thorough mechanized cleaning of the sewer lines is urgently needed to avoid blockade. Timings of supply of water to be publicized for information of all residents. OHT, which has become redundant and obsolete should be replaced with UGR at the same location. Billing system to be streamlined and simplified replacing the existing one. MCD: Inner roads and service lanes are in a very bad shape and they are required to be re-carpetted at the earliest. The entire storm water drains warrant thorough cleaning up and malba to be removed soon thereafter. The drains to be covered with appropriate size of concrete slabs where they are exposed to the sky. Builders to be warned not to block the roads with construction materials and malba which are required to be stacked properly and removed periodically. We appreciate the efforts being made by the local sanitary staff in maintaining cleanliness of the colony to a large extent despite mounting garbage! CFL bulbs to be made available at subsidized rates to the residents or at cost price which could save electricity. We highly appreciate the sincere Herculean efforts being made by the BSES in maintaining/repairing and attending to complaints promptly! DDA: No attention is being paid to one portion of the District Park (Anand Vihar side) facing the railway line for cleanliness, planting, watering, repair of the boundary walls etc. The walk-path requires repair/smoothening and avoid obstructions. A tree which had fallen a few months required to be removed. Provision of mast-light is urgently required for the benefit of senior citizens etc. who use the walking path in the nights as well. Railway: The entire portion of land belonging to the Northern Railway at Anand Vihar railway station, Delhi Division, warrant through cleaning, lighting, sineage with display of timings of trains passing through this halt station and a clear path to reach the Anand Vihar terminal from this Anand Vihar suburban station. Frequent ticket checking is required to be made and eliminate unauthorized loading of commercial goods from this station to Ghaziabad etc. Railway Board Employees’ Cooperative Housing Society Ltd.
1.The roads in the colony are in real bad shape with lots of pot holes and dug up at number of places. 2.There is no control of fast and rash vehicular traffic ( Speed Breakers Suggested on roads ). 3.Parks are in worst state with no one from MCD to take care of. 4.There is no bus shelter at the Sector-5 Bus Stop situated on the main road dividing Sector-5 and Sector-6 near Mount Abu School. 5.Dust Bins ( Dhallans ) as the MCD calls them are not properly handled. The garbage remains scattered on the road outside Dhallan which is an easy source of dreaded diseases. 6.The Fair Price Shops in the area do not distribute ration to the card holders and are manipulating supplies in connivance of the concerned Food and Supply Officers. Hope someone from the concerned departments shall take notice of our plight and do the needful . Share your civic problems on the blog ! VOICE OF DELHI ( www.RWABhagidari.blogspot.com ) : A common platform for the interaction of RWA's of Delhi, where, they can share the problems being faced by them, as well, can also contribute their suggestions, ideas, opinions & a lot more.We are offering you a platform to share your civic problems. You can upload on the blog, any social & civic issues with pics & vids. If u face the problems such as : dirty drinking water, no electricity, dug up roads, dead animals, dirty roads, no street lights, water logging, etc. etc. etc., plz feel free to upload here.It's purely a service to the community / society & therefore no money involved. Airtel Landline number not working for over Three Weeks now ? It looks like a joke that you need 72 hours to respond, when my phone is non-functional for over three weeks now, and the complaint number and interaction number have already been provided to you. Why can't such cases be dealt on priority basis? Please provide your mobile number so that I could explain my plight to you personally. Bombay Stock Exchange Ltd. (BSE), has been conducting Investor Awareness Programmes (IAPs) in different states all over the country. These awareness programmes are sponsored by the Investor Protection Fund of the BSE. Last financial year BSE- North Zone had organised 90 such IAP's across North India to provide awareness to the general public about the Stock Market. The main objective of the IAP is to create awareness amongst the investors and the prospective investors about the Capital Market and the safeguards that they need to follow while dealing in stock market. These programs are purely for awareness and has NO SALES OBJECTIVE WHAT SO EVER. The programme is normally of about two hours duration and covers different aspects of Stock market activities including Do’s and Don’ts for the Investors, Trading & Settlement, Risk Management followed by an interactive - session. During the programme, we also distribute to the participants, educative material about the capital markets. We would like to conduct such programme for your esteemed organisation and request for your permission to do so. If you kindly approve the above, please let us know the date and time convenient to you for conducting the aforesaid programme at your Organisation. If you are from any Registered RWA, plz feel free to join us on the blog. Plz write us with your complete contact details & a copy of your RC, with your pic. If approved, you will be invited to join the blog. After that your name & pic will appear on the blog & you will be authorised to write on the blog (Subject to our Terms & Conditions). Launching soon a mega RWA of Delhi , " VOICE OF DELHI ". Subscribe the RWABhagidari Blog. It's absolutely Free ! As per our records, our daily news mail is being sent to over 260 persons and over 250 persons who have subscribed it have not yet verified & hence not getting this informative news letter. If they verify the subscription, our daily mail list will cross over 500 persons including most of the active RWAs from various parts of Delhi. Please log on to the blog www.RWABhagidari.blogspot.com. On the left side there is a button named SUBSCRIBE BLOG. You have to add your e mail ID in that. After subscribing the blog, you will get an automated VERIFICATION mail to check that it's you, who has subscribed the blog. You have to open that mail & click on the CONFIRMATION Link to start getting our Free News Letter. Therefore, if you have subscribed the blog & not yet getting the regular updates, please log on to the Blog & RE SUBSCRIBE it as above. 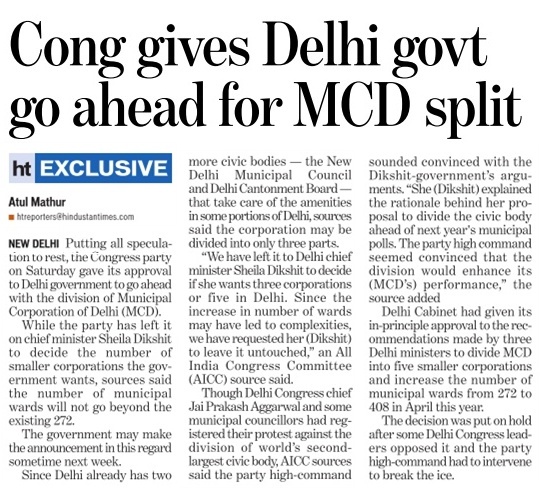 New Delhi: The Congress may be struggling to arrive at a compromise formula over splitting the Municipal Corporation of Delhi. But retired IAS officer K Dharmarajan and his team of experts charged with the responsibility of drafting a new legislation to replace the Delhi Municipal Corporation Act 1957 has already got down to the task of preparing a policy paper that will outline the contours of the new Bill. Besides weeding out large chunks of redundant provisions, the process seeks to create a local body framework that will involve greater participation of people through resident welfare associations (RWAs) and the voluntary sector. The committee wants to be ready with the draft legislation within three months. It will then be sent to the Delhi government. The Centre needs to approve the new legislation as the existing Act is a central legislation. In 2002, another report prepared by Dharmarajan became the basis of the property tax reform and led to a shift to the present unit area method of taxation. The DMC Act committee discussed the existing Act and the framework for the new legislation in its meeting on Friday. The first thing on its plate is the large chunks of the DMC Act which have no relevance to the MCD’s functioning any more. For instance, water, electricity, land use, the Delhi fire service and the slum wing, which were once municipal functions, are no longer under the jurisdiction of the corporation. The members feel that the new Act should simplify civic administration which is likely to be split into five even if the wards stay at 272. People’s participation is considered critical to make local-self government a reality. Thus, RWAs and NGOs may get a crucial role in the ward committees. The existing structure of ward committees is almost redundant and these committees are likely to great a strong role. The members are also trying to consolidate the civic administration as a body that will focus on socio-economic change. With MCD allocating funds for social benefits to the underprivileged like old age, widow pension, grants for marriage of daughters of widows, discussions are on to bring these functions under one umbrella for better management. The state government roped in Dharmarajan in February to assist the first political committee constituted to prepare a report on restructuring of MCD. 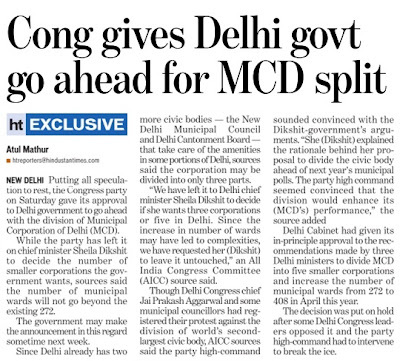 Its report recommended a five-way split for the MCD. The Delhi cabinet cleared the report in principle. But some Congress MLAs and most councillors are opposed to it. with thanks : Times of India : link in headline above for detailed version. As MCD is starved of finance : some suggestions ! We have been hearing that MCD is starved of finance and hence they are unable to undertake execution of all important pending projects. Here are a few suggestions for consideration for enhancing the finances of the MCD and make them to clear all pending works in a systematic and programmed manner to make Delhites happy and grateful to MCD! 1. It is noted that only 40 to 50% persons are paying property tax while the rest are not taxed. This should be tapped and strenuous and consistent efforts should be made on an 'operational' basis to net more revenue. 2. When the property value is soaring up in Delhi beyond imagination, people demand reduction in property tax! Is it not paradoxical? Why not an annual increase of 1 or 2% of the tax paid in the previous year so that people are aware in advance that they have to pay more in the following years. Are not prices of all articles soaring up, pension being increased, milk and petrol prices being increased periodically and water charges are being increased silently without anybody's knowledge by various means i.e. sewer and service charges etc.! 3. Hoardings in public places and inside the various colonies could also net some revenue, if the check is made periodically and properly. 4. Why worship places who amass wealth do not pay any tax, including property tax while occupying 'unauthorized' parks etc. where worship places come up overnight touching the hearts of everyone. 5. We have to park vehicles on MCD land inside the colony, why the MCD do not charge those who park their cars on an annual or periodical basis, based on space occupied. 6. Rental value of various accommodation let out by residents is going up but there is no proportionate increase in the amount of property tax being paid. 7. The MCD could arrange to collect the property tax from all recognized colonies by holding camps etc. say within 3 months from the commencement of financial year i.e. 30th June with no further relaxation on dates, so that the MCD could earn astronomical amount on 'bank interest' etc. The above are some stray thoughts but could be many more!The above may be thought-provoking and may be criticized also by many, but let us touch our heart and do some justice, so that the MCD could concentrate and improve the roads, service lanes and other facilities required to be provided by them like cleanliness of the colonies etc. When there is an all round increase in every aspect, is it justified for seeking reduction in property tax instead giving valuable ideas and suggestions to improve the finances of the MCD! Our expectations from civic agencies are very high and always critical but when it comes to payment to them, we grudge. Moreover, we have over 250 persons on the waiting lists as they have not yet verified the subscription, even though it's absolutely free. Once they approve the Free Subscription, our Daily mail subscription will cross 500 persons. We again request to various RWA subscribers to keep on writing to us for uploading on this blog. Please note, it's a common platform to interact not only with RWA community but also with the Media personalities & Social activists. Please forward this mail to your friends & well wishers so that even they can subscribe to the blog. Please log on to the Blog and on the left there is a Subscription button. Please fill your mail ID in that & do as said. After that you will get a mail to confirm from you that it's you who has subscribed to the blog. Once you confirm, you will be added to our mailing lists. Its absolutely free. Priyadarshini Vihar RWA received the "Earth Hour" 2011 cash award of Rs.50,000 from Hindustan Times at a function organized by the RWA on Sunday, 8th May 2011 at A-138 P.D. Vihar. Mr Shankar Ghosh, Mr DGM (Marketing) handed over the cheque to RWA President, Mr B. L. Poddar amongst loud applause. HT prizes were also given to volunteers who helped the RWA in organizing the event in a most innovative way. Mr Ghosh spoke about the importance of observing the Earth Hour and appealed to the residents to go beyond the hour and try to save energy every day to protect the environment from pollution. BSES Yamuna Power Ltd. also gave away prizes to some residents who actively participated in observing the Earth Hour on 26th March 2011. To encourage youngsters to come forward and participate in colony's activities, RWA gave a special cash prize to the BMMMC IInd year student, Sukriti Gupta, who took the award-winning pictures. Speaking on the occasion, Ram Gupta, General Secretary of RWA assured the HT that the Award money will be utilized to undertake green projects in the colony, such as, on-the-spot painting competition for children& with 'environment' theme; nature walk for residents; 'van mahotsava' by sr citizens by planting species identified during nature walk; use no plastic campaign by distributing cotton shopping bags to the residents free of cost workshops by experts to create awareness amongst the residents on "how to keep green"; and developing a herbal garden in the colony. Ram Gupta thanked the HT, JustMy Neighbour, and WWF for sponsoring the event and selecting Priyadarshini Vihar RWA for the Award. He also thanked BYPL for their gesture to honour the residents for their active participation. All the coordinators and residents were also thanked for their participation and co-operation in making the event a award-winning one. Plz click n click on the image above to read clearly or follow the link above. Krishna nagar is the First DLF colony & a posh locality of East Delhi. It has the busy Lal quarter market as well Jewellers lobby besides the Central park. The Main road has over a Dozen banks with ATMs in equal numbers. Many prominent hospitals are on Road number 57 touching Krishna Nagar with Dozens of Chemists shops. Visitors from far off areas too, visit the area for shopping & hence Law & Order as well Traffic jam problem is a routine issue. Mr Jagdish Vohra, President, Lal Quarter Traders Association, informed that, " Even though the survey for the CCTV Camers to be installed is ON for the last over two months, the traders body is still awaiting the results so that the Law & Order problem could be improved". Mr Bansi Lal, Gen Secy of the above association complained about the dirty drinking water being supplied by DJB as well spoke about the proposed APSI RAKHWALI YOJNA. Mr Alok, member of Krishna Nagar Resident Welfare Association, complained about the Law & Order problem of the area & informed that just a few hours ago a chain was snatched on the busy Lal Quarter area. Mr Inder Pal Singh complained about the encroachment of the footpaths by various vendors, causing a problem for the pedestrians & hence causing further Traffic Jams. Mr B S Vohra, President, East Delhi RWAs Joint Front (A federation of RWAs of Delhi East), complained about the severe parking problem in the area. He said, “even though, Lal Quarter is one of the busiest market of the area, there is no proper parking available & the proposed multi level parking under the Central park is still on papers”. He requested to the MLA Dr. Harshvardhan to expedite the issue to ease the area from congetion. Problems of severe Water logging during monsoon season & cleanliness in some areas were also raised by others. Balu jee is worried because mcd is short of funds and hence progress is at standstill on various projects. MCD is not collecting property tax from more than 60% of properties. So is the status of collection of legitimate money from mobile phone companies as more than 2500 towers are illegal. SURRISINGLY, RESPONSIBLE OFFICERS are not behind bars. IMMENSE LOSS IS BEING CAUSED BY OFFICERS IN LEAGUE WITH POLITICIANS. Do you know, Discoms seek a hike of 60% in Electricity charges ? 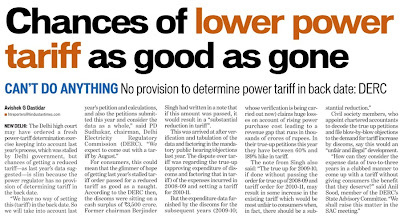 New Delhi: If you think your power bills are too high, here’s some bad news: Get set to pay even more. 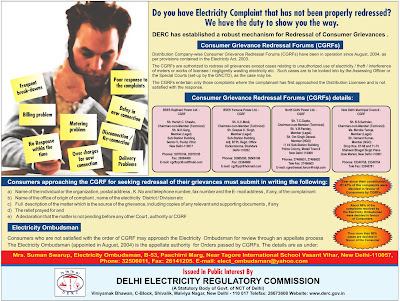 Power regulator Delhi Electricity Regulatory Commission has paved the way for a hike by sending fresh advice to the Delhi government which states that the current tariff was not ‘‘cost-reflective’’ and power companies were suffering under-recoveries of 30% to 50%. 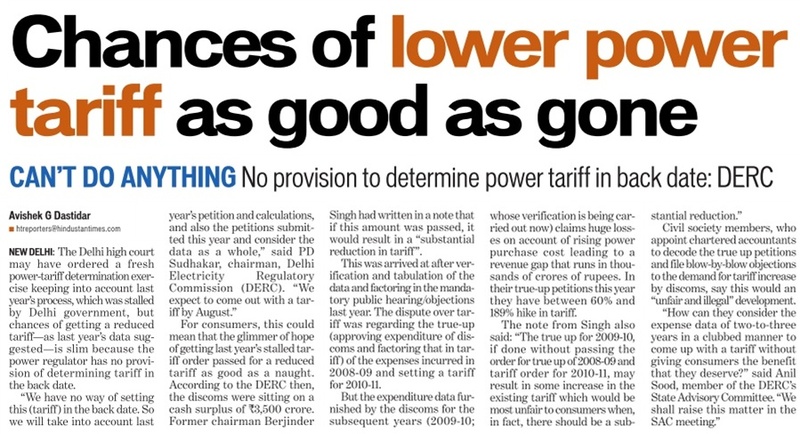 This comes less than six months after then-chairman of DERC, Berjinder Singh, had advised the government that discoms were misrepresenting their financial state. In May, the government had intervened to stop a tariff announcement by DERC which is rumoured to have recommended a reduction in power rates. Singh retired in September. Within 24 hours of receiving the regulator’s latest advice, the Sheila Dikshit government responded by not just accepting it but saying it validates concerns raised by the government on the discom’s financial conditions. The government had invited the high court’s ire for meddling in tariff fixation policies earlier this year and halting the May tariff announcement. The new advice also spells victory for the city’s three power discoms — BSES Rajdhani, BSES Yamuna and NDPL — who have been fighting for higher tariff for a long time. We are pleased to inform you that now onwards, the CASH counter timings have been enhanced i.e. 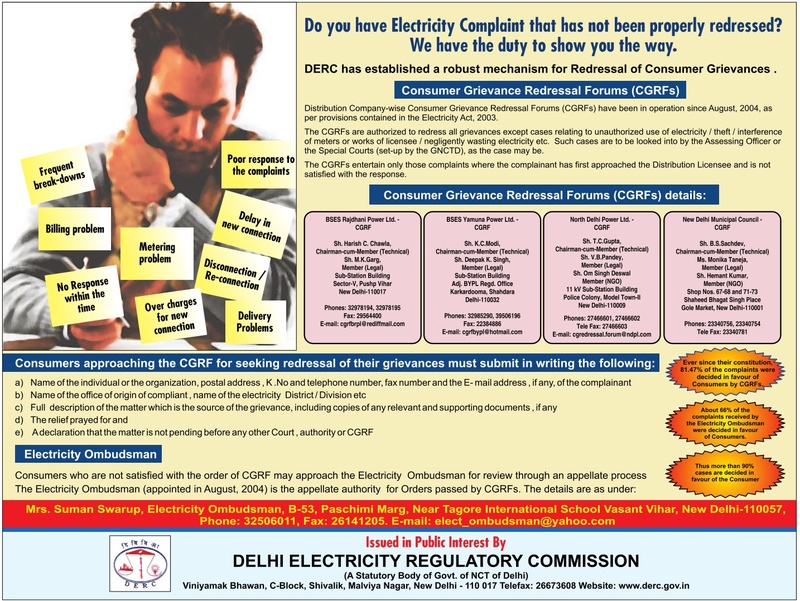 8 AM to 8 PM, for depositing the Electricity Bills in KRISHNA NAGAR DIVISION, address : F-15/2, Krishna Nagar, Delhi-51. Sir, I brought this problem to the notice of our area councillor RAVI SHARMA JI and ex mayor mcd sh.yog dhyan Abuja. For the last thirteen months we could not move any authority to help us. Kindly advise what we should do? Do you have Electricity complaint that has not been properly redressed ? 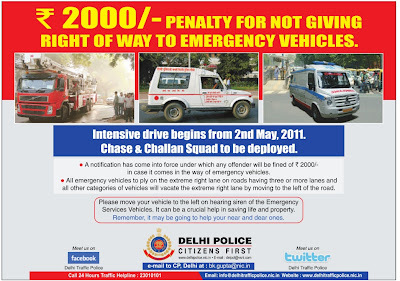 Is there any space left on Delhi roads, to give way to these Emergency Vehicles ? 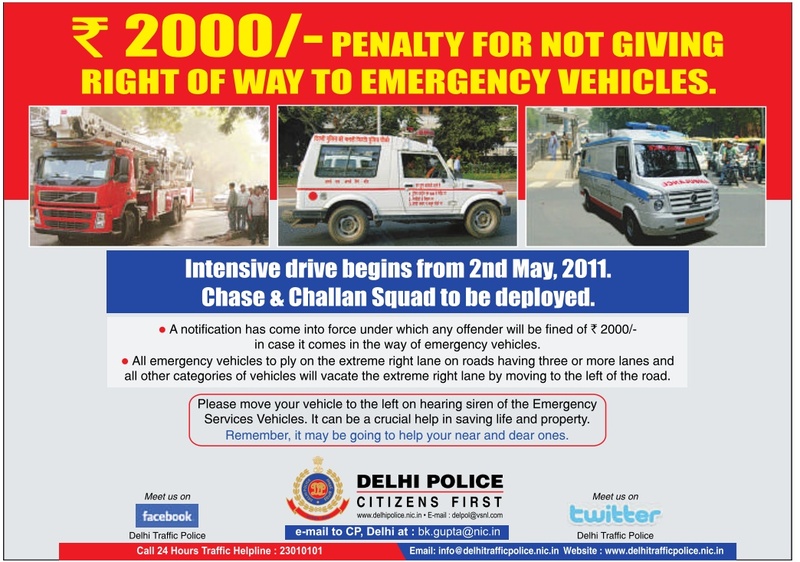 Hope this rule is not misused, as in most of the area's, there is no space left on the Delhi roads, to give way to these Emergency vehicles. Many a times, we just pray to GOD on listening Sirens of an Ambulance or a Fire Brigade vehicle. Even the limited & tired DTP staff is strengthless to help these vehicles. DTP must ensure that, this new rule, though necessary, is not misused. Can we now expect a reduction in Property Tax ?